In my late 20s I went back to school to finish my undergraduate degree. As a working adult, the daunting task of finishing that degree (I had at least 40 hours left) was overwhelming. But I quickly found an accelerated adult completion program that allowed me to do it once a week for around 18 months. And in the first weeks of the program as we started getting ready to tackle our first class and tidal wave of homework, I started getting nervous, big time. I hadn’t been in school in 5 or 6 years and even then I rarely did any homework or showed up for class. So needlessly to say, I was getting that sick feeling in my stomach again. It was odd advice at first. I didn’t know elephants were on ANY menu. But as the truth and practicality of that advice sank in, it changed me forever and my approach to big, huge, blistering projects. 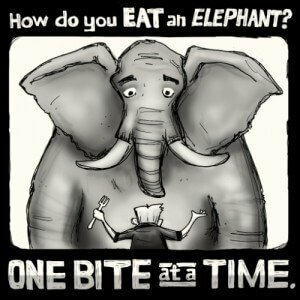 Of course eating whole elephants in one bite isn’t just gross 🙂 – it’s delusional, stupid, and impossible. But in our naivety or arrogance, we’ve all attempted to tackle projects that were actual elephants – monstrous skyscraper-like projects that simply swallowed us in the size of its scope. We bite off more than we can chew and we get choked up. We get lost, overwhelmed, frustrated and impatient. We want instant results, but we haven’t counted the investment or cost, and thus we lack the commitment necessary to finish right. We’re unclear of the goal, or don’t know what results we’re working toward. We run out of energy and time or mismanage both. We get sidetracked and distracted, bogged down and lost in the details, minutiae as well. We give up too soon or hang on too long. And to sum it up: We fail. We don’t finish. The project flops. And everybody is disappointed. On an almost weekly basis I run into someone having the same elephant-eating problem I was once had … so I want to share how I tackle big, huge, insane projects and coach others to do the same. Whether you’re tackling a project solo, or working on a team … doing something for yourself, or delivering it for someone else … you’re likely to be tackling the eating of an elephant. At this point, you’re just stressing yourself out needlessly. Emotion and adrenaline typically make things worse. So simply taking a moment to get some composure is going to help a TON. 2. Step back and get some perspective. Review and clarify the results you’re seeking. What outcome / goal are you trying to achieve? If you’re delivering it for someone else – what are their expectations? Oftentimes, simply knowing why you’re doing something helps tremendously. 3. Start breaking it into small pieces. This is the awesome part because I see all the neat parts that I’ll get to do. What’s really needed to accomplish this? People, tasks, timelines. How can I chop it up into small digestible bites? If it’s still too mammoth and overwhelming, how can I chop it up further? How long is each piece going to take? What are the tasks I can do quickly? If you’re delivering it for someone else – what are their expectations? And how does it differ from your own? Is it collaborative project? Which pieces will each person take on? Do you need someone else’s help? Which task(s) will make the most impact? 4. Now, review the investment and the journey. Which your smaller bites in mind, figure out how long the journey is really going to take … or how long you’ll be at the table eating your elephant meal. This means count the cost in terms of time, money, energy, momentum, etc. 5. Start eating the elephant. One bite at a time. Oh, and be sure to chew your food with your mouth closed. Don’t ever take on big freakin’ projects. In fact, the less of them the better. You only have time and energy for a few HUGE projects in your lifetime … so pick carefully. My big huge project is iThemes. I don’t have time for other huge projects, and I only have time for small bites of other’s big huge projects. Think of all the ways you’ll fail. Shocking advice, right? It’s good advice though. Know your big bottlenecks, challenges, and obstacles ahead of time. You WILL hit roadblocks, or fall into ravines, and if you don’t think about it ahead of time, you won’t know how to get around or across it. Report in regularly. Rangers at big national parks typically ask hikers and campers to report in as they make a big journey. Along the way, measure and report your progress. See what’s working and what’s not, or celebrate small milestones along the way. Accountability is a very good thing, ESPECIALLY for big, huge projects. Accountability also helps us prevent blind spots. Have deadlines and milestones. And then HIT them consistently, religiously. Don’t give yourself much slack if any. You’d be surprised how pushing just one deadline or milestone creates a snowball effect, turning into much bigger problems and delays for your project. The final bites of the elephant are ALWAYS the hardest. When you’ve been eating the elephant for a long time, you will inevitably grow weary and burned out. But that’s when you need to push hardest … to finish the last 10% of the project and ship and deliver. By the way, I ended up completing my degree program. It was a great accomplishment … and I ate the elephant, one bite at a time using the steps and advice above. Great read. One of my biggest challenges when tackling huge projects is striving for perfection. Sometimes it takes a good slap in the face to know that version one is exactly that, Version 1, and does not need to be perfect. Great advise. I needed to hear that. I am 44 and going back to school to complete my unfinished degree while working full time. I doesn’t seem easy, but I will do it one bite at a time!